A Nevada certification of trust is a document presented by a trustee, either voluntarily or upon request, to any party conducting business with a trustee. In Nevada, the certificate is codified at NRS 164.410. Instead of providing the entire trust instrument, the trustee presents the certificate, which contains information regarding the trust that is relevant to the transaction at hand. The document certifies that the trust exists and that the trustee has authority to act on behalf of the trust. 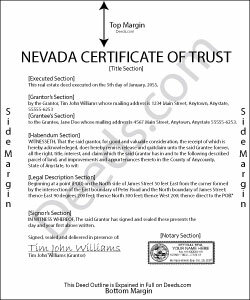 In Nevada, the certificate is an affidavit signed and acknowledged by all currently acting trustees of a trust (164.400). It attests to the trust's existence by citing the name of the trust and date of execution of the trust instrument, a document establishing the terms of the trust which generally is not recorded. The certificate includes the names of the trust's settlor, or person funding the trust with assets, and each acting trustee. It also states whether the trust is irrevocable or revocable, and by whom, if applicable. A certificate requires a description of the powers of the trustee in dealing with trust assets, and any restrictions upon those powers. When used in transactions affecting real property, the legal description of the property subject to the transaction should be included. For trusts with multiple acting trustees, the certificate also notes whether or not all of the trustees must act to exercise trustee powers. Any recipient of a certificate may request copies of the excerpts from the trust instrument designating the trustee and confirming the trustee's power to act in the transaction (164.420). Finally, the document gives the name of the trust's domicile and under which governing body the trust is subject, and provides the name by which the trust will take and hold assets. As the trust itself cannot hold title, property is titled to the trustee as the trust's representative. For purposes of recording, the certificate should meet all requirements for form and content for documents affecting real property in the State of Nevada. A certification of trust requires a statement that "the trust has not been revoked or amended to make any representations" incorrect, and that each currently acting trustee has signed the document. The certificate itself may be relied on by a recipient as fact; recipients are not liable for unknowingly relying on any misrepresentations contained within the certificate (164.430). Failure to request a certificate is not an improper act, nor is it indicative "as to whether the person has acted in good faith" in dealing with a trustee (164.440). Talk to a lawyer with questions concerning Nevada certifications of trust and their legal implications.